It’s strange for me to realize something. I’ve been operating as a digital nomad for the past few years while building up Martell Broadcasting Systems yet I’ve never done any specific blogs about the subject. I think I’ve learned a lot of important lessons along the way and so I want to share some of this hard-won knowledge with others. I’ve had to do a lot of long road trips, and I’ve also found myself stuck overnight at an airport yet had deadlines I needed to meet the next morning. It’s become critically important to me that I have a mobile office on me at all times. Recently I’ve invested into a proper kit to make my travel easier, as I expect to be doing a lot of it this year as we expand the Zenither service. Here’s what is in my kit. (Keep in mind, I also have TSA Pre Check status so I don’t have to go through the inspections on all my electronics and liquids, which is why having all this stuff isn’t a problem for me. Saves time and makes life easier, and I recommend it if you plan to do a lot of travel through the airlines). SOG Tactical Day MOLLE Backpack: Old habits die hard. I may not be Army anymore, but in my heart I’m still a grunt. 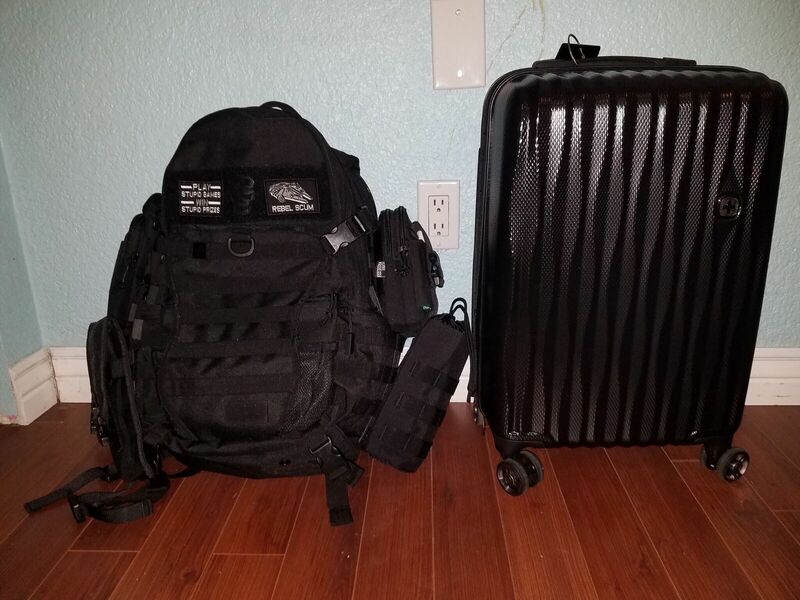 There are many different kinds of travel backpacks out there but I elected to go with a MOLLE system because I know I can customize it out with attachments. A pack that can be tailored to suit my needs was important to me. Yet I didn’t want something that looked distinctly military, and wanted something that might look more natural when I’m wearing a suit so I elected for a black model. I customized it out with a few attachments, and some cool patches that express inside jokes between my close friends and I. Anyway let’s talk about this pack and why I settled on it. Firstly it has MOLLE straps. But it also has an expandable exterior pouch meant for use with a sleeping bag, but I tend to use it to hold files and my laptop. It also has a compartment for a tablet, and a bunch of pouches for organizing things. One of the real perks though is the top of the shoulder straps have holes meant for a CamelPak drinking hose but I use in conjunction with my solar panels to charge devices (I mention this later). The only thing that bugs me about this backpack is the unnecessary skull head on it. I’ll probably find a patch to cover that up eventually. What is really nice is that the bag has an outside adjustable with a mesh net at the bottom pouch, seemingly meant to hold a sleeping bag, which I can put the MOLLE pouch attachments from the side into when I need to put the bag under the seat in front of me. OneTigris MOLLE Phone Pouch: I bought one of these to attach to the backpack. Condor Large Utility Pouch: I attached this to the side to hold my rolled up organizer of electronic things (flash drivers, headphones, portable hard drive, etc). OneTigris Drawstring Water Bottle Pouch: This also goes on the side of the bag, to hold my water bottle. OneTigris MOLLE EDC Pouch : I attached two of these to the top of my backpack to hold various items like my gum, my flask, my passport and so on. Swiss Gear Energie Hard Shell Luggage: This hand roller luggage cart is great but it appears to be exclusive to Target. It has a built in pocket and USB port, so that you can charge up your phone at the airport off a battery held inside the case. It also has built in TSA locks, too. And it’s small enough to count as carry on for most domestic and international flights, too. I bought this at Target. The Swiss Gear Energie model hardshell case is small enough to count as a carry on item for most airlines. The USB cord can be plugged into several different kinds of cell phone batteries. The USB charger port is easy to access without having to open up the case itself. Samsung Notebook 5 Laptop: I use a Samsung model laptop. Samsung phone: I also use an Android Galaxy phone. Samsung Galaxy Tab E: I picked this tablet up for free when I upgraded my mobile phone plan. They were basically giving them way. It isn’t the most powerful tablet on the market, but giving it is cheap and widely available I figured it is a good barometer for how our app will function on more powerful tablets. Epson DS-30 Document Scanner: You’d be surprised how often you need to scan documents in my industry. I know there are apps out there but you can’t produce high resolution PDFs from them, which is important when scanning certain types of things like legal documents. This one is very portable. HP OfficeJet 200 Mobile Printer: Yes, it’s heavy (the heaviest thing in my bag) but here’s why I carry it anyway. I tend to need to print a lot. When I first started out I figured I would just go to a print shop or an Office Depot when needed, but I found myself spending so much darn time in those lines that I opted to just buy one of these printers. The printer was incredibly useful during our recent court case. It’s also great because I can print out a contract on the spot. Goal Zero Nomad 7 Backpackers Solar Panels: Great item that I picked up at a Cabellas outdoor store. It comes with D rings so I can attach it to the exterior of my pack and thread the wires through the hose ports on the pack shoulders, allowing me to charge up my devices while on the move. Very useful for big events like SXSW. Accessory organizer: I don’t actually remember where I bought this one at, as I have had it for awhile. What I like most about it is that it can carry my flash drives, ear phones, connectors, USB cords, Chromecast and even a WD My Passport hard drive. It rolls up nice and slips down into one of the MOLLE utility pouches. But I also have a second accessory organizer made by BUBM which you can order from Amazon. Portable handheld stapler: I wrap it in a rubber band when not in use, as these tend to be poorly made and don’t close properly. Selfie stick and cell phone tripod: Pretty much essential tools if you plan to do a lot of social media engagement, such as taking photos and video on the go. I picked these up at a dollar store. Foldable Tablet stand: Also picked it up at a dollar store. I find it very useful for presentations on how our mobile app works. Universal travel adapter: Only for international travel, I like this model because it lays flat so it fits easy into my organizer bag. TUFFTAAG Travel ID Bag Tag: I attached this to my carry on, just in case I have to check it. This one is made of metal with a durable steel cord, and is large enough to hold a business card. Flint retractable lint roller: Super useful. If I’m traveling by car I typically hang my suits in the back seat but even if they stay in the plastic wrap from the dry cleaner, sometimes some lint gets on them anyway. I had a more traditional roller but the darn thing is so sticky, it tends to cling to anything else in the pocket it was in. This roller is designed to travel lighter and easier, and you can buy replacement rolls for it which is nice. Steamfast SF-717 Home-and-Away Mini Steam Iron: Great for ironing my clothes. A lot of Air bnbs I have stayed at do not have an iron in the closets, so I have taken to bringing my own. Samsonite Compact Inflatable Pillow: Advertised as inflating with two breaths and deflates in seconds. I purchased this for those long flights. I have neck problems stemming from the wear and tear I picked up in my Army days, and this makes some of the flights just a little more bearable. It folds up into a palm sized bag. Stanley Adventure Stainless Steel mini flask: For those very long flights. I do a’bit of craft cocktail making, so I like to bring an infused vodka mix with me. There are plastic versions of this but the steel model is slightly smaller so fits easier into my bag. Para 550 Heavy Duty Cord: A 100% nylon utility cord useful for keeping the MOLLE attachment bags on, and spare kept in the bag in case I need to strap anything else down which I pick up. Credit Card Protector: I also use this to hold my business cards so they survive all the traveling I do. Funtainer Thermos: Just the right size for traveling, and well built. It has to be empty when going through airport security but I can fill it up with water afterwards. Hand Sanitizer travel bottle size: Sometimes people want to shake my hand at inopportune moments, such as when I am about to eat. This allows me to do so without needing to worry about health considerations. Compact umbrella: For the rain. I have a small emergency poncho too. Gum: To keep my breath minty fresh. Microfiber towel: The one I have comes with a travel bag. I picked this up a dollar store somewhere and haven’t been able to find it again. I like how the bag helps squeeze it down to a good size. That’s what is in my kit right now. If you think I ought to have some other items, or any things you’d recommend, feel free to comment below. Zenither Ver.1.1 Released! We Have New Features! Carey Martell is the President of Martell Broadcasting Systems, Inc. Carey formerly served as the Vice President of Thunder TV, the internet television division of Thunder Digital Media. 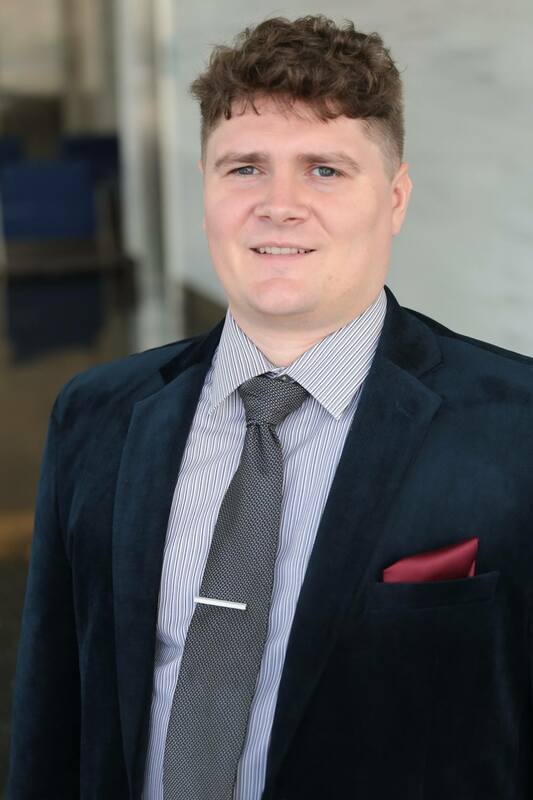 Prior to his role at MBS, Inc. and his career as a video game developer and journalist, Carey served in the US Army for 5 years, including one tour of duty during Operation Iraqi Freedom. Watch free movies & TV shows including content from indie creators like YouTube stars. Download Zenither by clicking the Google Play icon below or check web app by clicking the logo! Zenither Open Beta Has Launched!! !